In this video, I’m going to tell you the single event in my life that helped me avoid put downs in my class. I’m not talking about student put downs. That’s a whole different subject for another video. I’m talking about teacher put downs. Yep, you heard that right. Teachers who for whatever reason insult, humiliate or criticize their class too harshly. It shouldn’t happen. It’s unprofessional. It’s not what we do. But it does happen. We’re all human and we do make mistakes. The silver lining to mistakes, is that you can learn a lot from them. And I learned a lot from a mistake made by one of my teachers. I’m going to date myself, but in 1966 when I was in the sixth grade, we had a French teacher who taught French to the entire school. It was only our second year taking French. And, it wasn’t a popular subject, especially to guys in the class. But, all in all it wasn’t a bad class. We were learning French, all be it slowly, but we were learning, until one day when all learning stopped. A younger sister of one of our classmates told us what our French teacher said to their class one day. She compared our class with theirs and told the class how slow we were learning French. It did not go down well in our class. We all agreed not to answer any questions she asked. The next day when she entered our class and asked basic questions, only one hand went up to answer. That hand quickly came down when the entire class stared at the student and shook our heads. This went on until the teacher knew she couldn’t teach the lesson. I give the teacher a lot of credit for taking the time to listen to us and apologize. This was after all, a time when teachers strapping students was not uncommon for far less offensives in the classroom. So you can imagine what kids can do today with social media, smart phones and a public that isn’t as supportive of teachers as they were in the 1950s and 60s. 16 years later, I became a French teacher. And I did have many classes that were better than others. But I still remembered what a class of students did in 1966 to an unsuspecting teacher. And that single event in my life helped me avoid put downs in my class. 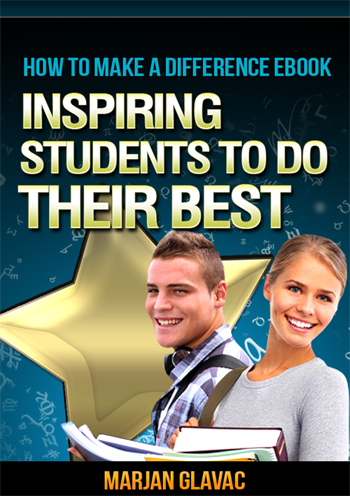 How To Make A Difference: Inspiring Students To Do Their Best is a 222 page resource with ideas and strategies on how to overcome obstacles, how to motivate your class and how to get yourself motivated when nothing seems to help. It also comes with a bonus workbook of 100 pages of activities, strategies and incentives to keep you and your class engaged all year long AND a 2.5 hour on-demand video. Click here for my eBook How To Make A Difference for more tips and strategies to inspire your students to do their best.